By 1821 the buildings of the University had been under construction for four years and were far from completion. Funds were low and Jefferson feared he would not live to see the University opened. 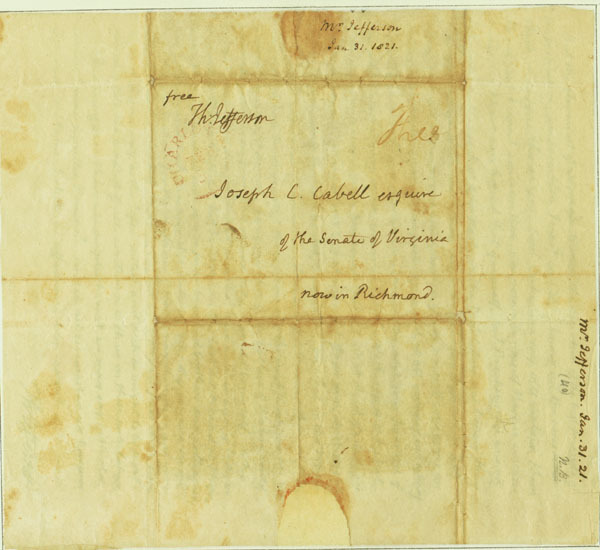 On January 31 he wrote Joseph Carrington Cabell, expressing hope that Cabell and colleagues friendly to the University would push the Virginia legislature for a loan to be paid off by 1833. He emphasized the necessity of teaching Virginians at the University instead of at Harvard where they would learn "anti Missourianism." Jefferson foresaw "awful scenes coming on [Virginia]" and asked, "what service can we ever render her equal to this?" For the University Jefferson would be willing to "die in the last ditch" and hoped Cabell would as well so that at the end of "these holy labors...we may say with old Simeon 'nunc dimittis, Domine.'"